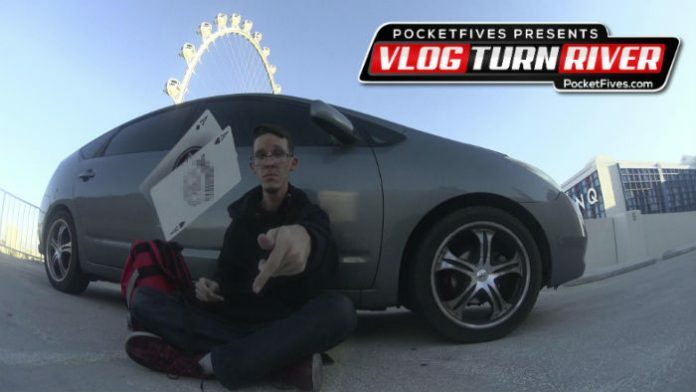 Andrew Pieper and the car he now calls home as he chases his poker dream. The average life of a live poker pro is hours consumed on the felt followed by whatever downtime is spent at home. For Andrew Pieper, the felt is his home. The 26-year-old is living a voluntary life without a permanent residence. Pieper values the utility and money saved over the material possessions that associate with a home. His dream plays out day by day. Pieper’s vlog is a compilation of him traveling around Las Vegas poker rooms and playing in low limit cash games. In only 21 vlogs, Pieper’s subscription base has grown to almost 2,000. His brand of in-depth hand reviews and gritty footage appeal to an audience that appreciates his off-brand approach to the lifestyle of poker. The vlog started last spring for Pieper. The South Carolina native moved to Las Vegas in January 2017 from Florida. The inspiration for vlogging came from watching Andrew Neeme and Brad Owen hone their craft to build an audience. “I was sort on the fence about starting but decided to give it a shot and bring a new perspective. It was a ‘test the water’ type-deal. This year, I’ve been more consistent with putting out content. I have a better schedule and goals,” Pieper said. The perspective of Pieper grinding his way around The Strip sets him apart from other vloggers. Pieper frequently inserts audio clips from Rounders into his vlogs and he bounces from property to property in a way that he ostensibly likens to Mike McDermott moving across New York City home games. The option of available games leads Pieper to have options when planning out his night. His favorite place to play is Caesars Palace. This is due to the action in the games and better lighting for him to record while playing. The eyes on his YouTube channel leads to interesting encounters for Pieper, who tries to downplay any form of a professional image at the table. When push comes to fold, if a player strikes up a conversation when playing, Pieper engages in his efforts to create a positive image for himself. The advancement of Pieper’s channel came from a few different sources. Using Twitter and Instagram, Pieper reached out to fellow vloggers in who turn used their platform to boost his. Pieper also found success by having a recurring column on another poker forum that led readers to find out more about his vlog and subscribing from there. Word of mouth worked for Pieper and production is the next item he is looking to get ironed out. Using more time to edit his vlogs and increasing the quality is a detail Pieper hopes will bring him more viewers with time. There is no long-term destination for Pieper as of yet. Playing poker for a living, vlogging the process, and not being beholden to any form of a home is a rewarding feeling. Pieper thinks that what he provides to viewers is enough for him to get more subscribers with time. “Being a professional poker player is a different lifestyle and showing that uniqueness and showing what it’s like to not have a ‘9-5’ appeals to some people,” he mused. The conscious mind Pieper has around how he presents himself at the table and on camera is his attempt to shed an ultimate positive light on poker. Whether that leads him to take on a role as a room ambassador down the line is yet to be determined. When Pieper wakes up tomorrow, he will look at Bravo and see where the best games are in his kingdom of cash games. The grind awaits.